All protected by the 1st Amendment. I joined ACT for America! in 2005 and became a Chapter Leader and gave lectures wherever and whenever I could. I used FACTS only as the basis for my lectures and yet there were still folks who considered my cause 'racist'. Other than that, I was met with apathy. The problem is that when people don't SEE mosques or Muslims IN their hoods, then the problem simply 'isn't there' and 'doesn't exist'. Sad but true. However, I personally met a lot of leaders of this cause and one in particular did undercover visits to mosques where he and his cohorts picked up some pretty damaging literature. Still, no one wanted to listen. Anything that takes a person out of their delusional comfort zone in lala land will cause them to reject painful truths. I keep telling them daily anyway, occasionally a sleeper wakes up. 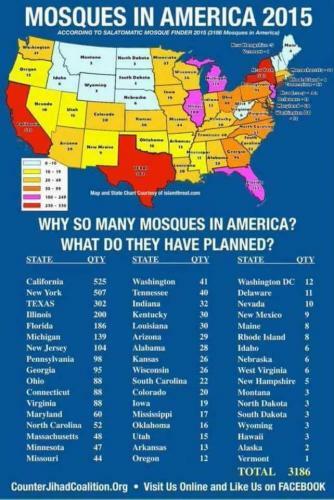 Why so many mosques? They are all arms stashes. I believe it's more hubs of information.